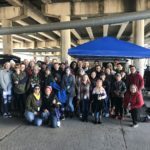 At Austin Humanists at Work, we love to host groups of volunteers from other organizations, and in 2018 we’ve set a goal to partner with other local nonprofits for the benefit of our community. 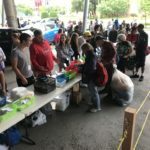 In the past our giveaways have benefitted from involvement from several organizations, including Austin Community College student groups, neighborhood association garage sales, and Austin-based teen robotics team, The Lady Cans. The Lady Cans have collected hotel toiletries for ATXHAW during competitions and requested other teams do the same. They have donated items, such as blankets, pens, bags, food and clothing, from their fundraising garage sale and closet clean-out events. Additionally, several members of the robotics team have also participated during monthly giveaways. 1. Come to a giveaway! If your group wants service hours, this is a fun, fast and easy way to collaborate. Send us a message (info@austinhumanistsatwork.org) if you’ll be bringing a bunch of volunteers, or if you’ll need us to sign off or document your involvement. We would love to have you. 2. Donate your old stuff! 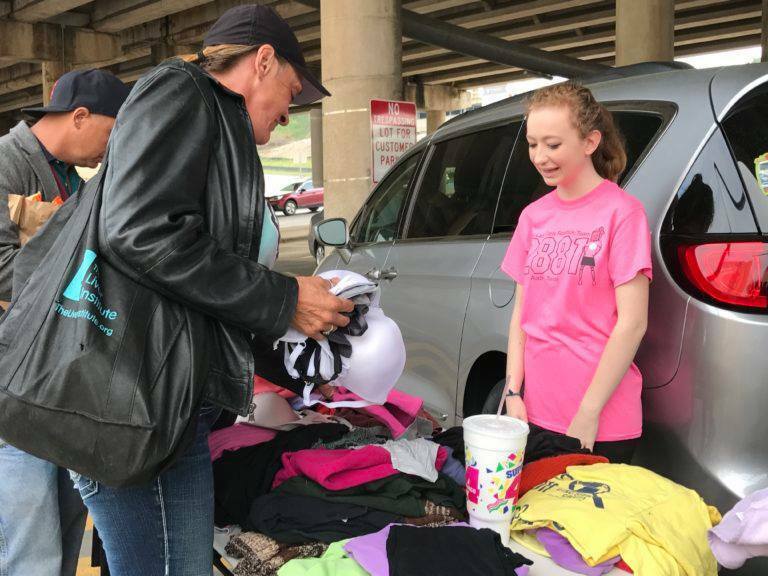 If your group is holding a garage sale or neighborhood clean-out, we will gladly take toiletries, blankets, shoes, bags, clothing and other items that you don’t sell. We will accept the leftovers, stuff that would otherwise go to the Salvation Army or Goodwill. Many donors appreciate our goal to help humans with no strings attached; our clients don’t have to apply or adhere to any creed to receive help. They just have to come to the giveaway. 3. Become a sponsor! 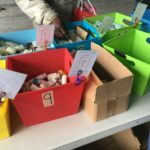 We have many opportunities for businesses and other nonprofits to give in-kind donations. Sponsors can pay for a month’s or year’s worth of a specific item, or big-ticket needs such as our storage unit. ATXHAW can feature sponsors in our collateral and on social media to showcase the generosity of our sponsors. 4. Host a fundraiser! This is easier than ever with PayPal and donations via Facebook. We’ve been able to raise hundreds of dollars through these means, just $5 or $20 at a time. Every dollar goes to supplies for the people we help. 5. Spread the word! Sharing our news, especially about drives, fundraisers and the volunteer opportunities can go a long way. 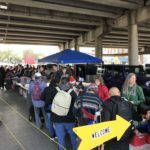 We have partners throughout Austin who have offered to host donation dropoff locations (such as PakMail on Metric Blvd.) and flyers about ATXHAW. We promise to share the love back.